Goodmorning you all. First thing I want to say: when you reside in the very cold parts of the USA, please stay safe! The extreme weather you have there was even on the Dutch news… stay inside and keep yourself and your loved ones warm dears! 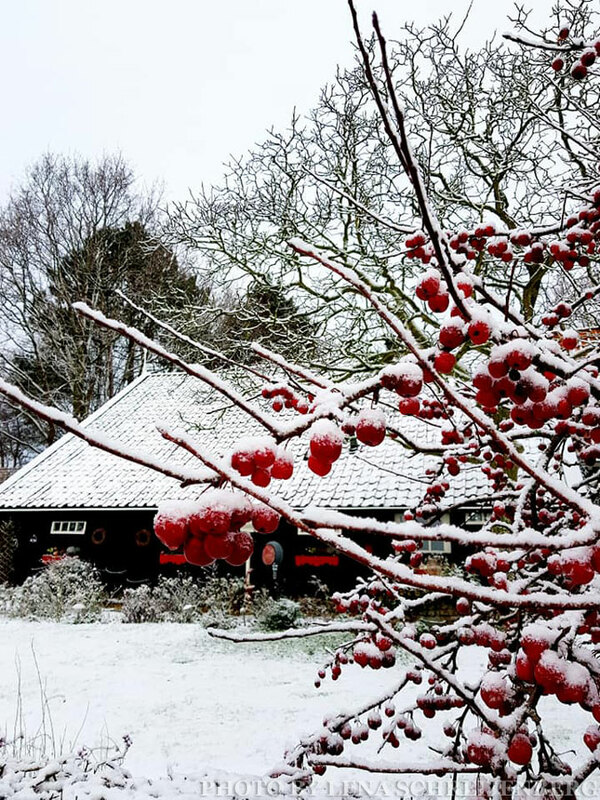 We did have a little bit of snow here in Zeeland last week… not enough to disorganize daily life but just enough to make the world beautiful. And do you want to know about the project I participated in? 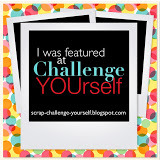 It’s quite a story, so sit down, grab a cuppa and let me tell you about it. Last December I received this message from a fellow-artist-friend, Robert Stockton, who lives in the USA. He send me some photo’s of the booklet (which isn’t a passport, but I’ll tell you about that in a minute…) and I got excited right away, what a lovely project to work on! And so after Robert finished creating his spread, he send the booklet to me. 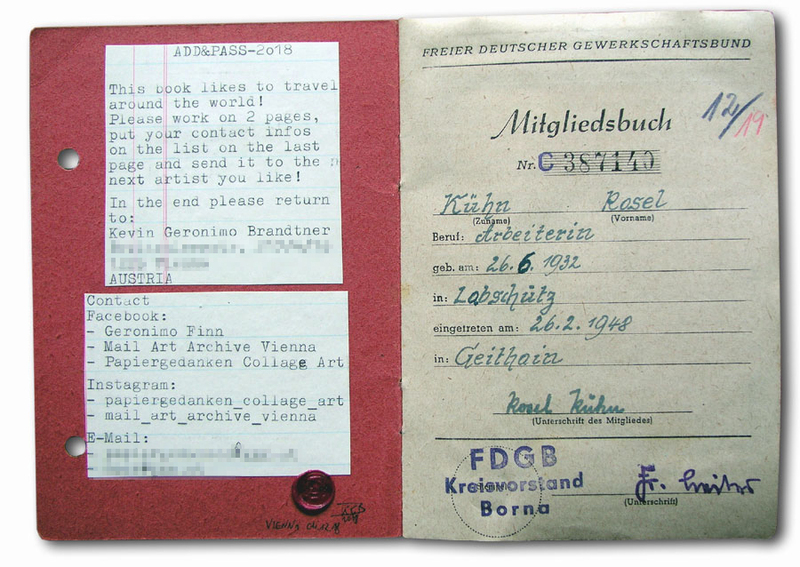 The booklet belonged to Rosel Kühn. 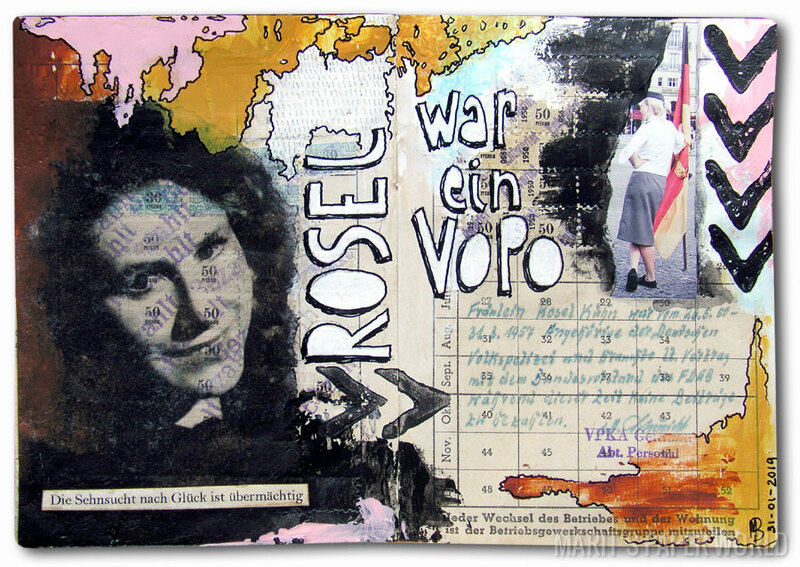 Rosel was born on June 26, 1936 in Labschütz (Austria) and the booklet was given to her (“eingetreden”) in 1948 by FDGB in Geithain (East Germany.) Given her birthdate I figured she could still be alive so first thing I did was to search for this person on the internet. 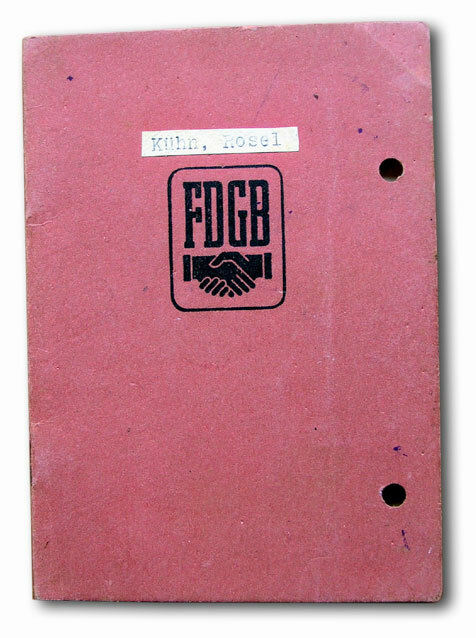 However, Rosel was only 15 years old when she received this booklet and Kühn must be her maiden name…. chances are big that she married and used her husband’s name from that moment on. I spend a few hours searching the internet but her name didn’t pop up anywhere so I shifted my focus to the FDGB. OK, so now I got an idea of this booklet and it’s purpose back in the days… so I flipped to the next page where Robert created his two-page spread on. I spend a few hours more at my computer, reading about the DDR (East German) the Deutsche Volkspolizei (popular known as “Vopo’s”) the Iron Curtain and the Berlin wall… (which I remember well ‘falling’ in 1989, I was 26) – I didn’t know much about the history and was highly surprised my beloved immediately said “Vopo’s” when I mentioned the Volkspolizei… I just learned about it and it turns out he knows a lot about German history all along! Printed: German text “The longing for happiness is overpowering,” phrase used in a review about the film. Stamped arrows, pointing to the handwritten text in the booklet. 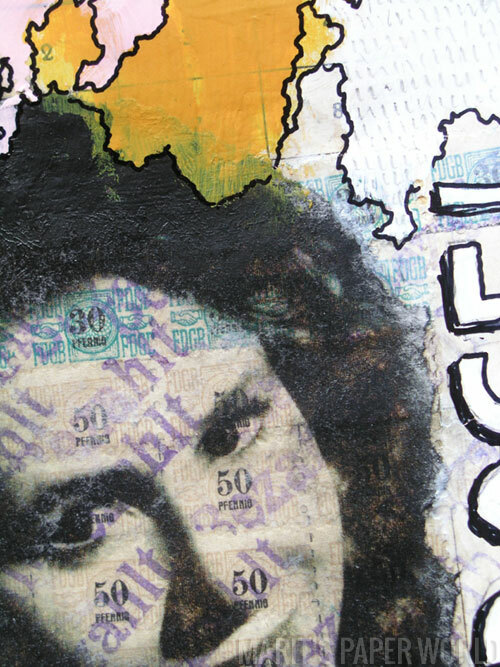 Detail photo of the photo transfer; the stamps underneath still show through the face. 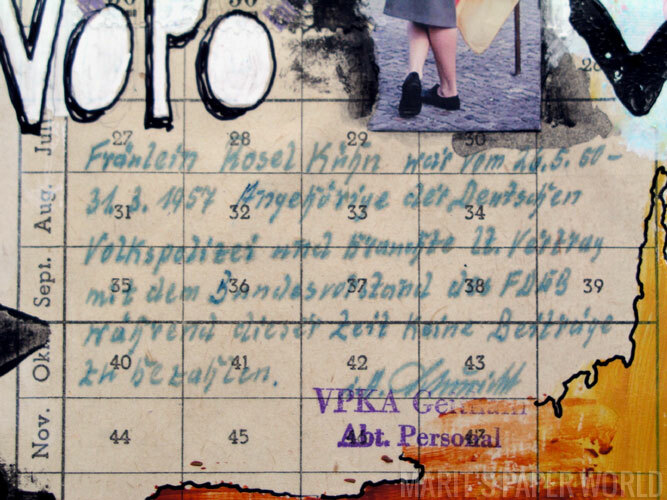 Detail photo of the handwritten notes in the booklet. Now that I finished my spread, this booklet will be on it’s way to Sweden. I contacted iHanna and she is willing to create the next spread… it’s coming your way Hanna! Thanks for stopping by and reading my ramblings today, have a great weekend. Stay warm. The winter photo is beautiful and your haiku is perfect with it. Nothing like fresh snow to brighten a winter day. The passport project is interesting. Amazing that you could find out so much about the booklet. I really like what you did with your spread. This reminds me of the times several years ago that I was involved with a group that made books and we went them around to different people until they came back to the original maker. Everyone picked a different theme for their book. Those were fun to do. The image of the crabapples wth little white hats is fabulous Merritt! 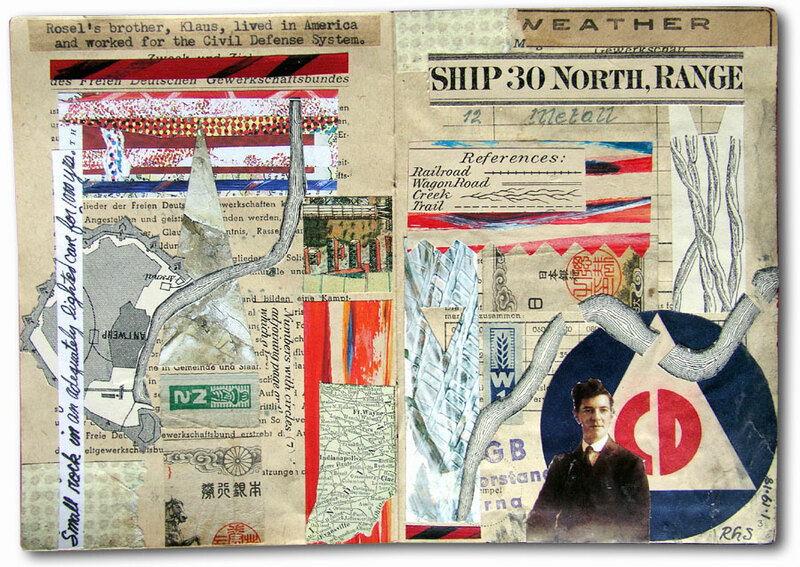 And the journal making and research that you put onto your pages of this art piece is fascinating and poignant. Thank you for sharing them both. Love to you my friend! Wish we could share an artichoke together! Winter-wonder hat! What a delightful image, Marit. Thanks for this precious little gem. OH MY GOODNESS, MARIT! The amazing research and incredible discoveries you have made about this little booklet! You have done much to illuminate some very dark corners of history. Your two-page spread is visually stunning and tells a story that causes Rosel’s past, as well as East/West German history, to come alive. Wondrous! What an amazing story! Enjoyed reading all your research and love the spread you created – so meaningful. Have a fantastic weekend. 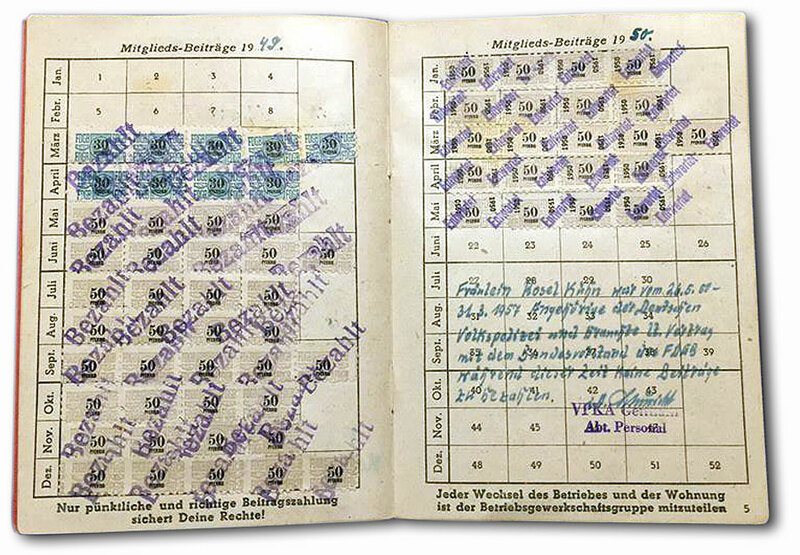 I originally came for the haiku, but the story of the not-a-passport is fascinating! I love how you did your art spread to preserve her written note. Geweldig project Marit. Wat goed dat je zoveel info boven water hebt kunnen krijgen over Rosel en wat heb je er iets moois van gemaakt. That is a fantastic a wonder piece of art. What a way to tell a story. your positive attitude to life, sorrow and loss. Wat geweldig leuk zo’n idee en zeker ook dat je het onderzoek ernaar deed. Het resultaat is heel sprekend, niet in de laatste plaats omdat de stempels nog te zien zijn. Supermooi. 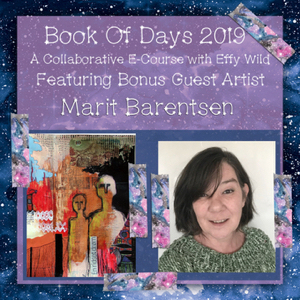 Oh wow Marit, I love all the background history you’re giving this project, but it also makes me nervous. I doubt I’ll live up to creating something as important & cool in my style, as I’m more of a pink rainbow girl… But we’ll see what I come up with. Thanks for asking me, I look forward to seeing yours and Robert’s spreads in person! your winter haiku is magnificent! just perfect joyful beauty- thank you friend!